It is always quite easy to hope that physical assets offer a port in a storm at times of crisis in the investment world, but the last three months have served as a reminder that fine wine is also a luxury good and cannot totally escape both the benefits and drawbacks involved. The point of divergence in October in essence reflects the fall of equity markets from their all-time highs partly resulting from concerns about a slowdown in global economic growth. If growth is to slow down (the argument goes), particularly in Asia where there is a lot of interest in fine wine, then buying will diminish and prices will fall. When equity prices are high people feel more confident and have more disposable income, both of which lead to the purchasing of fine wine. At Amphora we have long argued that fine wine prices don’t need a buoyant global economic environment, but they do benefit from a sense of stability. This affects demand at the margin. Those people who push the boat out when times are good are likely to rein in their extravagances when conditions deteriorate. It is quite easy for most people to tone down from a £200 bottle of wine to one costing about 75 quid. If you are a multi-millionaire the majority of your behaviours don’t tend to change during economic downturns. You will certainly be focussed on ensuring that your financial circumstances are secure but you are still going to fly at the sharp end and buy nice things. This is likely why the Burgundy sub-index has barely batted an eyelid over the last 3 months. 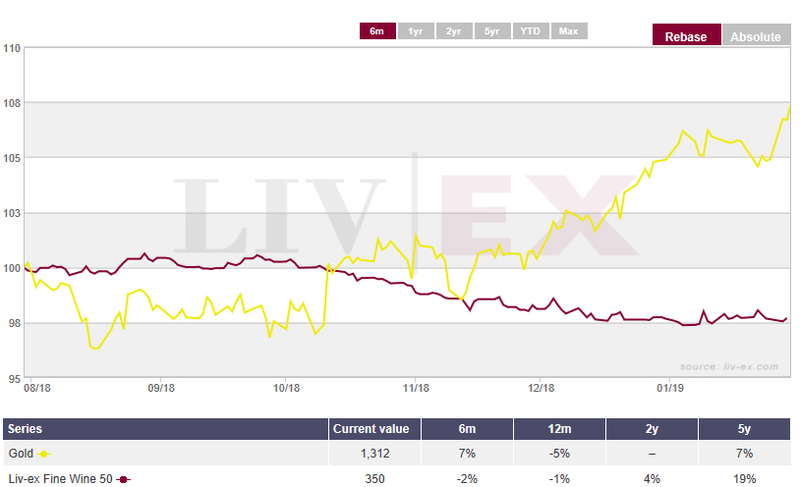 It has outperformed gold over that time even as prices in the broader fine wine market have declined. These matters touch on our contention that fine wine can benefit a diversified investment portfolio in both good times and bad. It is an interesting time when looking ahead it is easy to imagine both a host of headwinds and a host of tailwinds for our market. – A badly handled En Primeur campaign. Last year was a bit of a disaster. A decent vintage priced out of sight. In light of that it is no surprise that of all the Liv-ex 1000 sub-sectors, Bordeaux performed worst. Some of us grew up to the strains of Peter, Paul and Mary wondering where all the flowers have gone: “Oh when will they ever learn, oh when will they, ever learn”? The Bordelais, that is! – A global economic downturn/escalation of the trade spat. Under these circumstances we suspect the marginal benefit to the fine wine market from consumption would erode. The Flaming Ferraris would be keeping their light under a bushel. Collectors at the high end would be active because they might see offers emerge from the less fortunate needing to offload to raise cash, but under these circumstances the market might bumble along much as it has over the last quarter or so. As to tailwinds, well, a reverse of the above. Frankly it’s hard to gauge what on earth might happen on the Brexit front, but the odds seem to be shortening on a “harder” departure, which would keep Sterling under pressure and fine wine cheap (relative) for foreign buyers. To be honest we are not in the Brexit forecasting game, but for anyone who is, the more difficult the divorce, the worse for Sterling, the better for fine wine prices. – A fine wine portfolio could be the best hedge around against No Deal! – It is by no means assured that the trade wars will perpetuate and that the global economy will grind to a halt. The financial press lately seems to be of the view that there is no bank liquidity and businesses can’t get the funding they need, but before you swallow too many global-credit-freeze pills do bear in mind that all the latest money supply data is actually perfectly benign. As are the loan growth numbers from around the world, so we wonder if this is the most likely area of pleasant surprise for 2019. We don’t actually believe that in times of uncertainty such as currently prevail, all roads lead to physical assets. If investing were that simple far fewer hedge funds would have left 2018 with egg on their faces. At times of uncertainty you need careful risk management, because you have to account for potential upside surprises, as well as downside, and risk management speaks to diversification. When you diversify, you are essentially placing less bets, not more, because you are moderating risk, and what we at Amphora do actually believe is that investing sensibly in fine wine is a great way to do precisely that.